Makes 1 big, yummy cake! • Line each pan with a round of parchment paper (see page 10). • Position two oven racks in the top and bottom thirds of the oven. Preheat the oven to 350°F. • Place the water, buttermilk, oil, and eggs in the medium bowl. Whisk until the eggs have completely blended into the mixture. • Sift the flour, sugar, cocoa powder, baking soda, and salt into the larger bowl (see page 11). • Pour the liquid ingredients into the dry ingredients. Whisk gently at first, and then, as the mixture blends, whisk faster, until it is a smooth batter and you don’t see any more dry patches. • Scrape the batter into the prepared pans, dividing it as evenly as you can. Put one pan in the center of each oven rack. Bake until a toothpick inserted into the center comes out clean, 30 to 35 minutes. • Transfer the pans to a cooling rack. If the cakes are rounded on top, place a clean, dry towel on top of each warm cake and press down firmly with the palm of your hand to level the surface. Cool completely. • Sift the powdered sugar into the medium bowl (see page 11). • Place the room temperature cream cheese and butter in a large bowl and beat until they are blended and smooth. Add half of the powdered sugar and beat it in thoroughly. Scrape down the bowl with a silicone spatula. Add the remaining sugar and continue to beat until the mixture is blended and fluffy. Beat in the vanilla extract. • Slide a small spatula around the edges of the cake to separate it from the pan. Set the serving plate upside-down on top of the cake pan. Hold the plate and cake (in the pan) together like a sandwich, then flip them over. The cake will fall out of the pan onto the plate. Peel off the parchment paper. • Use a small offset spatula to spread half of the frosting over the cake, stopping about ¼ inch from the edge. When you put the second layer on top, it will squish the frosting out to the edge. • Spread the remaining frosting over the top layer. 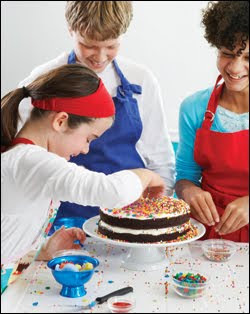 Decorate the top with sprinkles, confetti candy, sparkling sugar, or whatever you Like. You can leave this at room temperature for a few hours. Otherwise, refrigerate the cake until serving time. This cake batter makes great cupcakes. It will make 24, so you’ll need 2 standard-size cupcake pans with paper liners. Divide the batter evenly among the cups, filling them no more than ²⁄3 full. Bake on two racks as described in step 1, until a toothpick inserted into the center comes out clean, 15 to 20 minutes. Cool completely before frosting the cupcakes. If you like chocolate frosting, try the one on page 20. board and into place on the frosting. Peel off the parchment paper.